Located in Central West New South Wales is Mudgee and 28 km to the north-west of Mudgee is the township of Gulgong. No visit to Gulgong should ever be complete without a visit to the local museum. The friendly staff will make you feel more than welcome. The Gulgong Pioneers Museum is located at 73 Herbert Street on the corner of Bailey Street in Gulgong. It is open from 9 a.m. to 5 p.m. seven days a week. 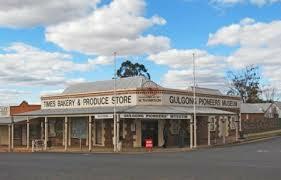 If you are visiting the Mudgee area for any reason and you have adequate time we can thoroughly recommend a visit to one of the great museums in Australia: the Gulgong Pioneers Museum. The main aim of the museum is to allow people to feel a definite connection to earlier generations, particularly the pioneers that once lived and worked in the town. The museum has many virtual period-type shops including a bakery, a butcher shop, a barber shop, a small cafe and an old telephone switchboard that once was used to exchange phone calls within the town. There is even a hospital ward that is period set. The museum even has an antique printing press which at times is in operation for visitors to see. Gulgong grew rapidly after gold was discovered at Red Hill a few hundred metres away from the current museum site in the 1850’s. By 1872 the population had grown to over 20,000 with over 50 hotels registered. The museum has many examples of the way life was carried out during this period and the volunteers have done a fantastic job in creating the atmosphere of this period. Included in the displays are a number of sulkies, wool drays and a great variety of coaches that give us a great insight into how visitors would have travelled throughout the town and how work was carried out using these various implements. There is also a wide variety of farming implements that were horse-drawn and used during this period for various methods of agriculture. Steam power was also used extensively during this period for a variety of purposes and there are several examples of steam engines at the museum. Directly across the street from the museum in a building is a large collection of memorabilia including vintage photographs, phonograph machines and a host of other old recording machines. This building is dedicated to this type of collection. At the Gulong Pioneers Museum the friendly staff will provide you with information of the walks that are available within the town to highlight some of the historic landmarks. The staff will be only too happy to give you some direction as well as maps of the walks and any additional information if it is required. Gulgong was the town featured on the original $10 note that was superseded some years ago. There are lots of places of interest within the Gulgong area and one of the best places to source this is through the Mudgee Regional Tourist Information Centre located at 84 Market Street, Mudgee or at the Gulgong Visitor Information Centre which is located at 66 Herbert Street. You can contact them by phoning 02 63742691 or visit their website by clicking here. Please enjoy your visit to our area and don’t forget to tell your friends about our wonderful museum as we are very confident you will enjoy your visit.